Has Being a Superyacht Crew Member Become a Dream Career? Bon Voyage! It’s time to set sail on your dream career, and it may not have been one you originally considered! Working as a crew member on a superyacht can be a very fulfilling job. At one point it was considered a job that you can do for a few years while you are young before settling down, and make/save as much money as you can before transferring to a position on shore. However, things are changing, and changing fast. More and more individuals are considering becoming a superyacht crew member as a career choice, find out why. One of the most popular reasons people consider becoming a crew member because it is a means to see the world. Scratch that, get paid to see the world. How many jobs do you know of that pay you to travel to some of the world’s most beautiful locations? Through the years, there have been more legislation and maritime laws put in place to make becoming a crew member more appealing. Many of the laws protect crew and require owners to provide insurance coverage and other benefits to crew, making the position more attractive. Working onboard a yacht now often requires an extensive level of professionalism. There is much more to it than helping to keep up a boat while getting to sail around the world. You are serving guests who are paying for and expecting a high level of class and service, and the yachts are becoming more and more sophisticated. If you go through all the training, then there’s a good chance you will want to make it a long term career. There are many different positions on a superyacht crew. From Deckhand, to Captain, there are plenty of opportunities to move up the ladder. Yachts are being built every day, and those new positions must be filled by someone, preferably with some experience. Superyacht crew members can make a great salary. The amount of money you make usually coincides with the size of the yacht you are working on. 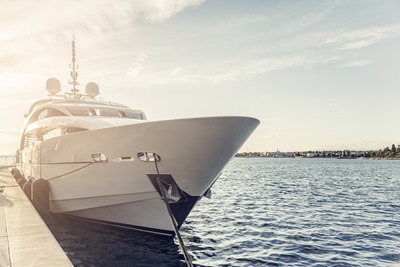 Not only is the money great, but while working onboard you can save a large portion of it because you won’t need to spend much while on a yacht. You live on the vessel, so there is no rent, and your food is normally also covered. While the money may be great, there is a catch. You will be required to be away from home and/or your family from home for long periods of time. This may be why a career choice is often for those who are single. Anyone can become a crew member, but no one can become one overnight. Working onboard a yacht can require you to have training that is highly specialized. Whether you are the person setting the tables, or the person cooking the food, there are training and classes one must take before working at sea. Depending on the position, you may need a combination or training, licenses and certificates, and practical experience. There are many reasons why being a yacht crew member is a great career choice, however it is a big decision to make. It will require a lot of dedication and commitment, so do your research in order to assure that this is the career of your dreams. Having proper insurance is important whether you are at sea or docked at a shipyard. MHG is your specialized broker when it comes to crew insurance. Our insurance specialists have the knowledge and experience to find the policy that works best for you. If you are interested in purchasing, or have any questions about yacht crew insurance or travel insurance, please contact us at +1 954 828 1819 or +44 (0) 1624 678668 or visit us online at mhginsurance.com.